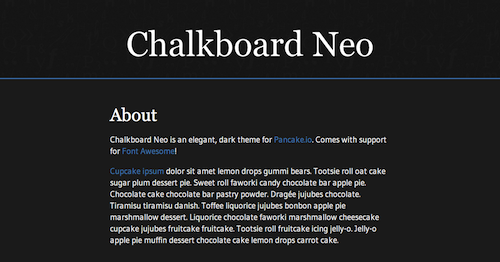 To kick things off, here's Chalkboard Neo, a dark and elegant theme. More themes will be added over time. For the latest, you can always check out our Github repository. Feel free to fork and modify the themes for your own use. Instructions for developing and sharing your own themes will be posted soon as well. 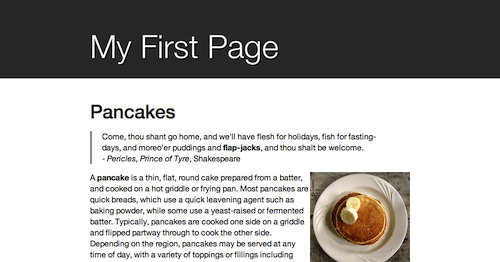 For early testers of the custom domains feature, your domains can now point to a subdirectory instead of the top level Pancake.io directory. And a new secret feature: embedded file lists can now take blog_mode=true to be smarter about the dates of posts. Previously, the date used was the file's last-modified date. With blog mode, if you prefix a file with its date, e.g. 2012-12-25-Christmas Delight.txt, that date gets displayed instead! This means you can make changs to a post without changing the date which is shown.